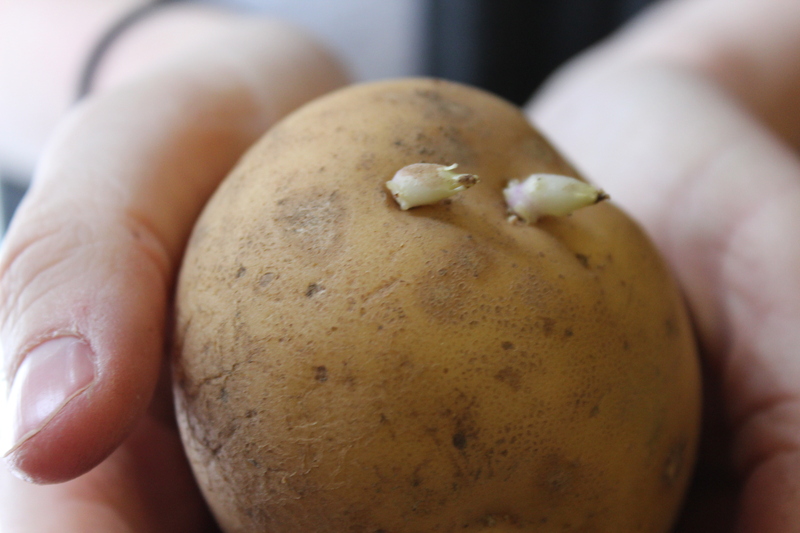 When I was young, finding potato sprouts (commonly referred to as “eyes”) was very common. No fuss was ever made, they were simply cut off before cooking. And if we wanted to, we could take the cut part off containing those eyes and plant them. As the years went by, seeing potatoes eyes became far less common, as conventional potato growers began using an herbicide to prevent them from sprouting. This would enable them to last longer on store shelves. On an organic farm such as ours, such sprays are prohibited, so organically grown potatoes will produce sprouts eventually. They are completely harmless; you can eat a potato with sprouts! Just cut them off before cooking like Mom used to, but if the potato itself has become mushy, it should be discarded. It means that the nutrients of the potato are being used for the next generation, and there’s not much left for you. So take heart if your potatoes are peeking at you – it’s just nature at its finest! And you can be confident that your potatoes are indeed organic.